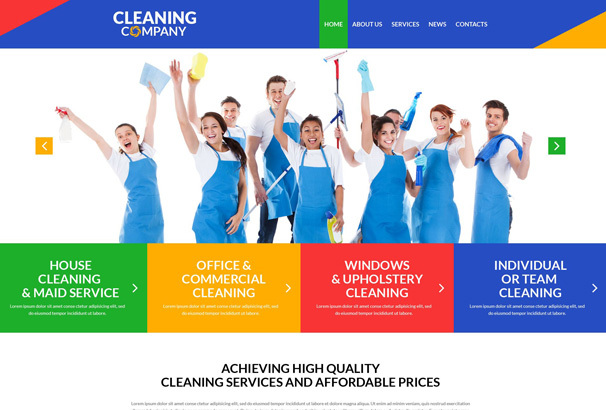 Are you looking to create a website for your cleaning company ? If so, WordPress is an easy to use and customize solution for creating your online presence. WordPress is especially good for small businesses which are on a tight budget, no need to hire expensive companies to create it for you as you can download WordPress completely free, then all you need is some Web Hosting which can cost as little as $5 per month and then you will need to choose a suitable theme for your website. The theme provides the look and functionality of your website and there are many thousands of options to choose from. 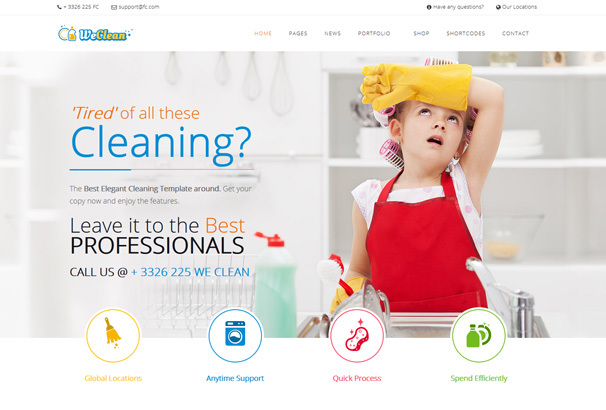 You can get WordPress themes for many different types of businesses and cleaners and cleaning related companies are no different, in this list we have hand-picked the best modern and well designed examples of Cleaning Company WordPress themes. These themes would be suitable for cleaners, laundromats, commercial services, plumbing and other related businesses. 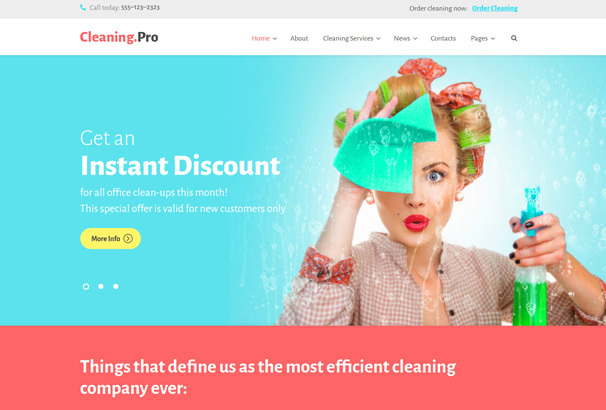 Cleaning Pro is very versatile WordPress theme suited for a broad range of cleaning companies. It comes with easy to use page drag & drop page builder which allows you to effortlessly build a beautiful website tailored to your business. It offers a ton of layout options to choose from, beautifully designed call-to-action buttons to increase conversion rates and more. It comes with live customizer option so you will be able to preview your changes instantly on your website. With this possibilities, satisfaction is guaranteed. This is a beautiful eye-catching WordPress theme with bright colors, modern design, and easy customization options. If you are looking for a theme that requires little to no support then this is a winner. You can easily change fonts, colors, and with 5-minute demo install it’s ready to be used from-the-box. This theme is smooth, attractive, modern looking, and mobile phone friendly. Also, 24/7 free technical support is very responsive and helpful. With this theme, your cleaning company will look trustworthy and provide customer satisfaction. 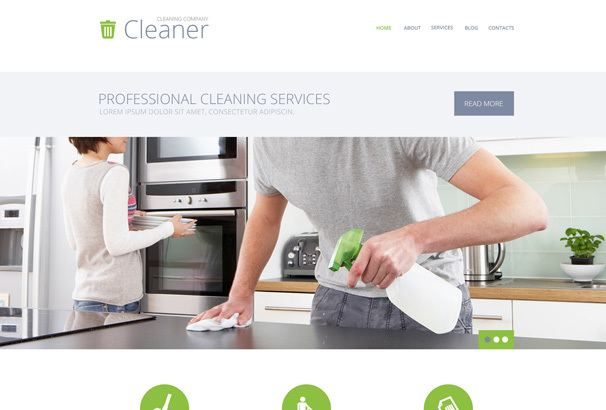 Cleaner services is a crisp, modern looking theme with pure white background and clean looking design. It includes Cherry Framework which will allow you easy drag & drop site building, no technical knowledge required. It comes with detailed instructions which are easy to understand and follow. Technical support is always available for any of your requests. If you are developer, a well written, light and clean code will surely provide you with a quick solution instead of building it from the ground up. This modern looking theme is fully responsive and cross-browser compatible which assures that your business will be available for both desktop and mobile users. It’s clean and crisp design will be more than enough to show your off your services, and with already integrated social media you will be able to promote your business and take care of your customers. From a developer’s point of view this template is well crafted and easily editable with excellent ration when it comes to price and quality. Good starting point for developers who create cleaning websites. It’s built on Cherry Framework with added Bootstrap functionality. 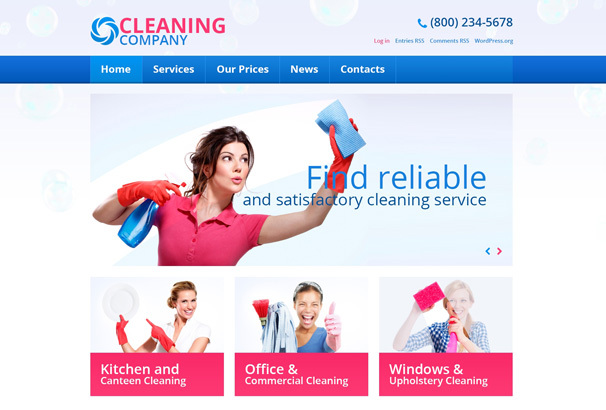 Cleaning company WordPress theme comes with a plethora of options which gives an edge when it comes to customization. Content blocks and sliders are responsible for proper information presentation without clutter and poor readability. Services are nicely organized within the layout and small graphic pointers guide users through website options. Very useful and handy for new visitors. It comes in a strong blue variant to bring the idea of freshness and cleanliness to the visitors. It’s responsive and fast, with good color choices and page design. On top of that, it comes with nice and available customer support service. Cleanco is a beautiful and professional looking WordPress theme. It’s specially designed with maintenance, cleaning and maid service in mind. Because of its versatility, it can be used for other company or corporate websites. It comes with everything you need to build your website from start to finish. Its interface integrates and utilizes user-friendly theme options, drag & drop builders, custom posts, and advanced portfolio options. With unlimited color options, SEO optimized code, and unlimited custom sidebars CleanCo can be easily your new business website. 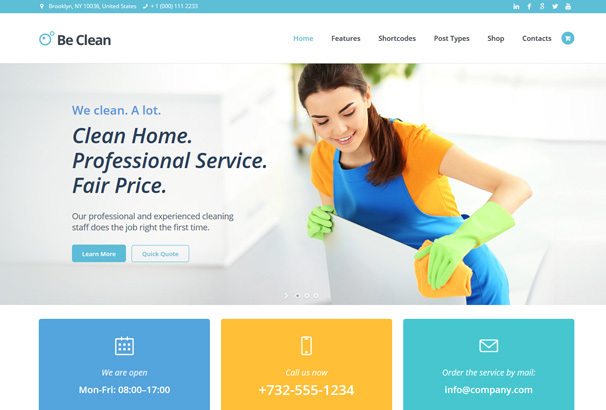 We Clean is an elegant WordPress cleaning theme with the variety of options best suited for virtually all general maintenance and cleaning services. It offers 5 dual color skins and 20 different color schemes, 2 layout options and 6 different header types. Fully customizable Mega Menu allows you to sort and present content in a more readable and accessible way. With options to get quotes for different packages and newsletter subscription it definitely stands out as a highly professional theme with more than meets the eye. Also, it’s worth to mention that this theme supports Woocommerce and comes with great customer support. If you want to raise your business to another level this theme will surely do its job. 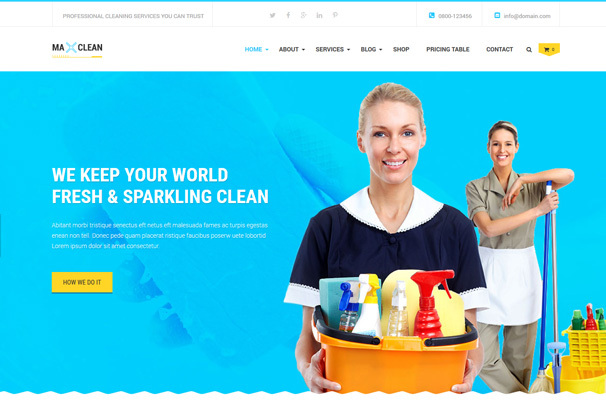 Cleaning Company is a high-quality cleaning & janitorial WordPress theme crafted by Ancorathemes. Overall crisp and fresh look of this theme will definitely attract visitors who are looking for a professional cleaning service. The layout offers various options to present your service to your customers. Appointment calendar and quote request come as a good addition if you want to offer your customers easier and better approach to your services. Theme options allow users to customize the website in any possible way, and with lots of shortcodes and custom widgets, this theme brings a lot to the table when it comes to quick and easy content management. 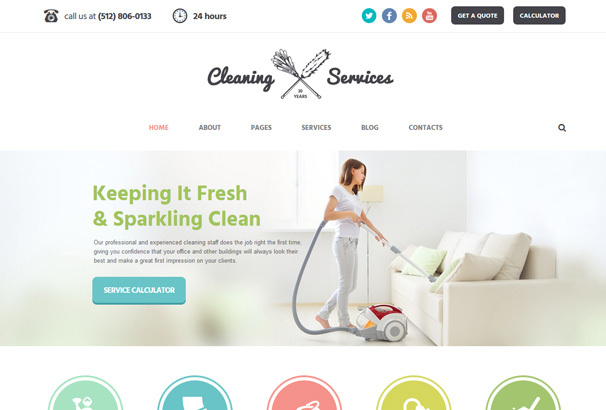 With 24/7 support and extensive documentation, Cleaning Company is a perfect WordPress theme for any service business owner. Cleaning 69 theme is one of those clean and flexible themes aimed for general service businesses. With retina ready and responsive design it looks flawless on any device from desktop to mobile. It’s built with Bootstrap and comes packed with features. Thanks to the intelligent admin panel and one click demo install you will get your website up and running very quickly and with drag & drop builder you can definitely adjust the theme to your liking. Also, free support is available on the support forum. Be Clean is another modern looking cleaning and services theme. This theme is an all-in-one tool and comes with everything you need to setup your business from ground up. It’s packed with advanced functionality like cleaning cost calculator and integrated Woocommerce to show your services in a more professional way. It comes with retina ready display, Google fonts, unlimited menu colors, and responsive layout which will be definitely noticed by your visitors. With detailed knowledge base and helpful customer support, this theme is a perfect choice for your website. 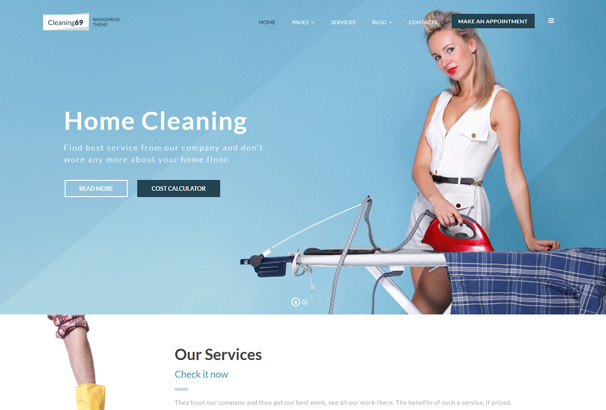 Cleaning Service Company is a beautiful WordPress theme that emphasizes user experience, proper information structure, and simple, clean, and fresh design. 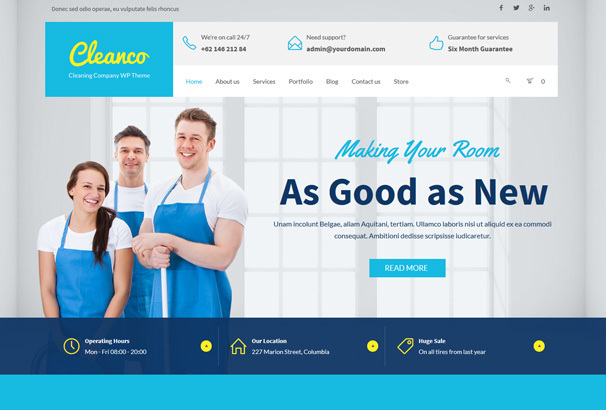 Although it’s described as a maid service company, maintenance, and general service company it can be converted to become any business site thanks to powerful and feature rich theme options. It looks great on all types of devices and with SEO optimized code and fast loading times, it will unquestionably rank you very high in the local search rankings. Just to mention that you can contact the support team via support tab any time you run across theme problems. Max Cleaners & Movers is a new, and versatile WordPress cleaning theme that comes with unlimited portfolio and blog layouts with included and already installed extensions. It’s cross-browser compatible, responsive and looks good on a broad range of devices. Also, it’s translation ready with added support for the WPML plugin. From a developer perspective, this theme is built on the Bootstrap framework which offers a wide range of customization and with available .less files, this becomes a breeze. It’s very flexible and can serve as a multipurpose theme for any corporate website.